When you cross the rusting drawbridge leading to Breaux Bridge, Louisiana, you enter a south Louisiana town long acclaimed as the Crawfish Capitol of the World that has drawn “foodies” from around the world. However, since 2014, this bustling town in Acadiana has gained added cultural dimensions with the establishment of the Teche Center for the Arts, a center on E. Bridge St. housed in the old “Murph Theatre." Foodies who appreciate art and culture as well as fine cuisine, can easily find the Center in the middle of town, a few doors down from a foodie haunt, Sydnie Mae’s Restaurant. The Teche Center for the Arts, directed by Sandra Sarr, has as its mission to feature music, art, theatre, literary art, French lessons, history and educational exhibits for St. Martin Parish and surrounding environs in south Louisiana. As The Center was a movie house in the 1940’s, it’s complete with a stage on which poets have begun to perform readings. 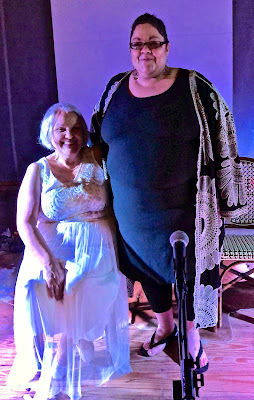 Last night we attended a reading of Crone, a book of poetry written by Clare Martin and dramatized by Clare and a fellow poet, Bessie Senette, before a full house of regional poets and artists. Crone has received kudos from Louisiana Poet Laureate, Jack Bedell; Sheryl St. Germain, Writer of the Year 2018 at the Louisiana Book Festival, and Luis Alberto Urrea, author of House of Broken Angels. Clare and Bessie read to an appreciative audience that saluted them with "Bravos" when the long poem ended. I found it heartening to see so many young adults in the crowd — and I attribute this interest to the workshops and readings of outstanding Louisiana poet laureates: Darrell Bourque, Jack Bedell, Ava Harmon, and Julie Kane, as well as the long-time efforts of Patrice Melnick, director of Festival of Words. I hadn't read Crone until this morning, and when I began reading Clare’s written version, Robert Frost’s "Witch of Coos" came to mind. Like Frost, Clare used several voices to weave this supernatural "song" that held her audience spellbound. She used primitive chants divorced from rational, traditional verse, that was further emphasized by costuming, linking sorcery and spiritualism in an imagined dialogue between a wise woman and her devotee. At the reading, the audience was mesmerized by long incantations featuring props of candles, feathers, silk scarves, and a cauldron to deliver lines. One of the Crone chants caused me to reread: "The undulating core/of the universe encapsulated/in a most tender bulb of skin./Her breath’s ignition/resurrects the miracle nerve./It is nothing like love,/it is nothing—/Be brave, she says,/It will hurt more than a little/when I grind the scars." Clare is unsparing in her images of female suffering; e.g., lines like "dried blood flakes from her fingers./A black tooth drops/into the cauldron," and I was startled when I heard her read this last line at the performance. Yet she predicts resurrection and deliverance in the verse: "God’s secret name must not be spoken./And yet, you call upon it over and over./ When you are desperate to believe/you are free." From that point, Clare moves on to more hopeful imagery: "We lie between the five mounds/beneath the flowering pear./Still, the wind gossips/of summer grass." For me, that last line resonated strongly in Whitmanesque power and loveliness. The performance ended with a quotation from Rilke: "I've been circling for thousands of years" which she uses to preface end verses: "I've been circling for thousands of years,/planting seeds of conception./I've been waiting for God to show a mighty hand./I am an Old Woman, pregnant with ephemeral dust./This is proof enough for me." In one former comment Clare made concerning the long poem, she claimed that she "channeled" a crone, and, at times during her performance last night, I felt she was or had been channeling when she wrote the entire poem at a week-end retreat. However, I really feel that Crone is a product of the freed-up imagination of a poet who has emerged from the shadows, or her own Shadow, as Jung defines the traumas that live in our memories and cause problems and suffering. 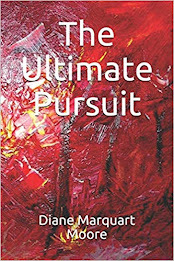 Clare founded the online poetry magazine, MockingHeart Review and Crone is her third book of poetry. It was published by Nixes Mate Books and is available on Amazon. Contact Clare Martin to find out more about copies of this spell-binding book.